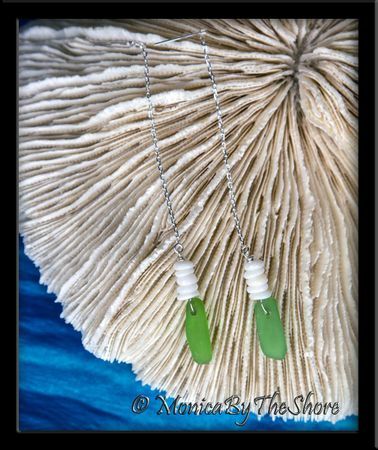 Sterling silver "threader" chain earrings dangle tiny North Shore Puka Shells and bright green Sea Glass washed up on the shore break of Ke Iki Beach on the famous North Shore of Oahu! 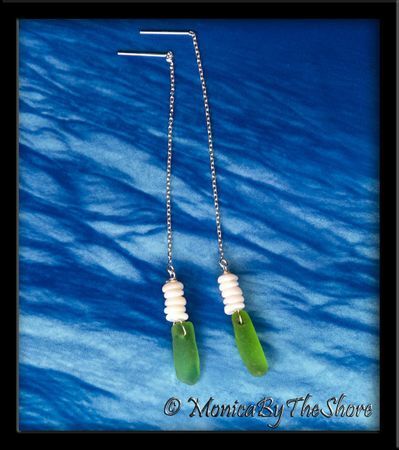 The chain portion of the earrings is 2 1/2 inches, total earring dangle length with shells and seaglass is 3 3/4 inches. Wear them shorter or wear longer for a more dramatic look! Super fun to wear and the perfect compliment to the 6 layer Puka Shells Cuff Bracelet (see Bracelets page)! Hawaiian style, wearable Aloha to enjoy anywhere, anytime!